Hello Friends! I can't believe how quickly these last few weeks have flown by! My goodness, Thanksgiving is THIS week! Are you all ready? I still have a few more things to do and then I'll be all set. I'm really wanting to put up one of my Christmas trees for Thanksgiving this year. That's a first for me. Anyway...I have a card to share today. 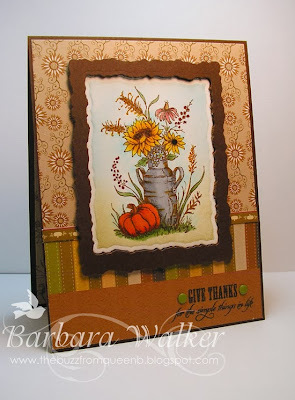 I used another sweet image from the Autumn Blessings set from Flourishes. I am so pleased with myself for not only inking up all of the images in this set, but I also created a card for each! That's another first for me! I fell in love with all the images in this set when it was first released and I knew they would be so fun to color. Click HERE to see another card featuring this set. Nothing says Autumn to me better than pumpkins and sunflowers...The addition of this rustic watering can and a few branches of wheat just adds more charm. I simply LOVE this image. Click to enlarge it, so you can see all of the details. 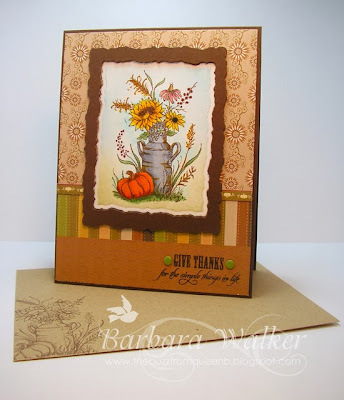 Flourishes creates some GORGEOUS stamp sets! Perfect for those of us who like to color. I stamped this image onto my favorite card stock, using brown ink and colored it with Copic markers. I'm still trying to perfect my pumpkin colors, but I think this combo turned out nicely. I die cut the image and dusted on inks. I created a frame for my focal, by die cutting the center of the brown card stock and adhering it with dimensional adhesive. I created some layers using patterned papers, then I embossed the greeting and added a few candy dots to finish it off. Although, the camera does not show it, I added glitter marker to highlight areas on the image, giving it just the perfect shimmer and sparkle. That's all from me today...Thanks for stopping by! Oh my goodness, Barb, this is absolutely gorgeous. Wow, wow, wow! Your coloring is phenomenal! Your paper choices are impeccable and your design is perfection. Wow! So, so pretty! Thank you for sharing. I hope you and your family have a lovely Thanksgiving sharing those simple things that really are the big things. Hugs!